An Aplusix resource proposes exercises. At launch, the application opens with an exercise statement and the starting expression of the first exercise. The user can do her own step from a new empty step or by changing a copy of the starting expression, with the virtual keyboard of Aplusix. For each action, Aplusix checks the syntax of the expression. When the syntax is correct, the button "Check" is displayed. Clicking on this button will check the equivalence with the previous step. Aplusix indicates when the exercise is solved. It also indicates "almost solved" when there are only few simplifications left. The document also includes a zone for "Auxiliary calculations" in which the user can write whatever she wants (text or formulas) and do calculations (for example to caculate a discriminant). Get the main menu, see below. In the connected mode, you have to do a "End of the exercise" before going to the next exercise. When you are not connected, you can go to the next or previous exercise whenever you want. above the virtual keyboard, thus you can easily change the displayed operator. which enables inserting a fraction: (1)following , (2) with x as numerator,(3) with 5x as numerator, (4) with 4+5x as numérator, (5-6-7) with different division operators. Paste. When pasting inside a formula, you have to tell which operator to use for pasting. You can use the red and green selection cursors to change this selection. You can also, if you do not raise your finger, extend the selection by moving it after the first selection appeared. With a computer, you can select as usual with the mouse or the keyboard (Shift+arrow). The 4 arrows allow changing the selection in a very accurate way (and different from what you get by dragging the red and green cursors). You can perform cut,copy, paste and delete. The arrows enable moving the cursor keeping the selection. The "Duplicate" button duplicates the selection on the location of the cursor. The "Move (calculation)" button performs a dynamic algebra operation if Aplusix can do it at this location, see above. But if you used the palock button, the selection remains in all the cases and can only be removed using the "Deselect" button. When you use this button from the selection palette, you ask to make a calculation on the selection. The possible calculations are choosen by the author of the resource. For instance, if you select 2(x+5y) and the expansion is allowed, you get 2x+10y. If you are in the main zone, the result will replace the selection. 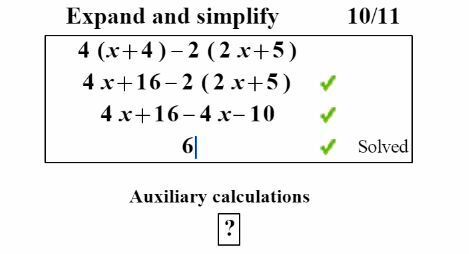 If you are in auxiliary calculations, the result placed below and an explanation is given. Sometimes, several calculations are proposed in a menu. It is the cas if you select 30, you will get a menu that proposes to factor 30 in four different ways. 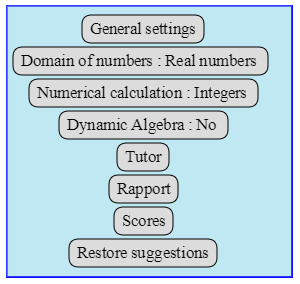 To know what calculations can be made, display the general menu and look at the values of the "Numerical calculations" and "Dynamic Algebra" buttons. "Numerical calculations" indicates the kind of numbers that can be calculated. 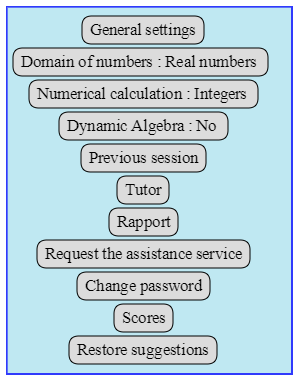 "Dynamic Algebra" indicates the chosen dynamic algebra level. If Aplusix has been launched without any exercise, these levels can be changed by clicking on the buttons. When Aplusix is launched with exercises, these levels cannot be changed, they have been chosen by the author of the resource. You can also do this by selecting 2 then do a classical drag and drop. It works well on computers. On tablets and smartphones, it is more difficult as the gestures are less accurate and the finger hides the items. That is why the method with a selection and a cursor has been designed. For each action, Aplusix indicates syntax problems and, when the expression is well formed, the equivalence of the step with the previous one. Equivalent step: green check mark. Non equivalent step: red cross. Not comparable expression ( for example a polynomial and an equation): black cross. Aplusix displays a green check mark followed by "Solved" if the step ends the exercises. Aplusix displays a green check mark followed by "Almost solved" if there remain only some simple calculations to solve the exercise. Aplusix displays a red cross followed by "Not solved" when you tell that the exercise is solved and that is not the case. When you use the "End" button, the exercised is locked. It can be unlocked with the "Modifiy" button. The first three items have been explained before. The fourth enables connection/disconnection, see below. On this panel, you can change the language, change the zoom, connect/disconnect, access the general menu, the application details (with « ? ») and the type of device. 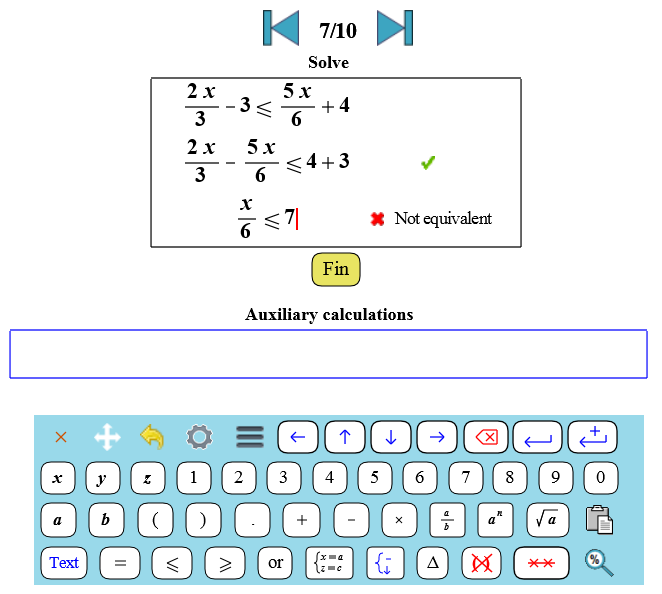 The virtual keyboard for the text input in the auxiliary calculations zone is very simplified cause you can use the physical keyboard. A click outside the selection, when there is a selection, removes the selection. When the user is connected, she can display in the web browser a report of the work done and give its link to whomever she wants. She can also register the email address of a tutor(a teacher, a parent,... that agrees such a role) to notify her some work sessions or ask for some help (send email with a direct link to the work done on the given exercise). She can also ask for help to the support service. When the user quits the test, Aplusix switch to "correction", then the feedback is available again and displayed. The user can switch from the training mode to the test mode using the ⏬ button just on the right of the "Training" button. The author of a resource can set it up so that it will run on the test mode from the begining.